Convert video to iPhone, iPod,Zune,Apple TV,PSP,and other mobile devices. iSkysoft Video Converter is a very professional video conversion software, can convert video to AVI, MP4, MOV, MPEG etc for iPod, iPhone, Apple TV, Zune, PSP, Pocket PC, Creative Zen, and a lot of MP3 players and audio players. iskysoft Video Converter lets you set video brightness, contrast, saturation, crop video, trim video, batch convert your video files, and even merge multiple files into one file, also a m2ts video converter. ...... It is a professional all-in-one video converter and video to audio converter. 2.Support the most popular players.iskysoft Video Converter converts videos for iPod, iPhone, Apple TV, Zune, PSP, Pocket PC, Creative Zen, Archos, and a lot of MP3 players and audio players. 3.Crop video.Crop video to remove the unwanted video sides. 4.Various video and audio settings.Set video output settings including resolution, frame rate, encoder, and bit rate, and set audio output settings including sample rate, channel, encoder and bit rate. 5.Trim video.You can trim your video files to only convert a part of a video file. 6.Customize video effects.Set movie video brightness, contrast, saturation, and choose to apply special video effects to your video files. 7.Merge file.Merge all added files and output one file. 8.Preview.Preview your video files before conversion to adjust the output quality. 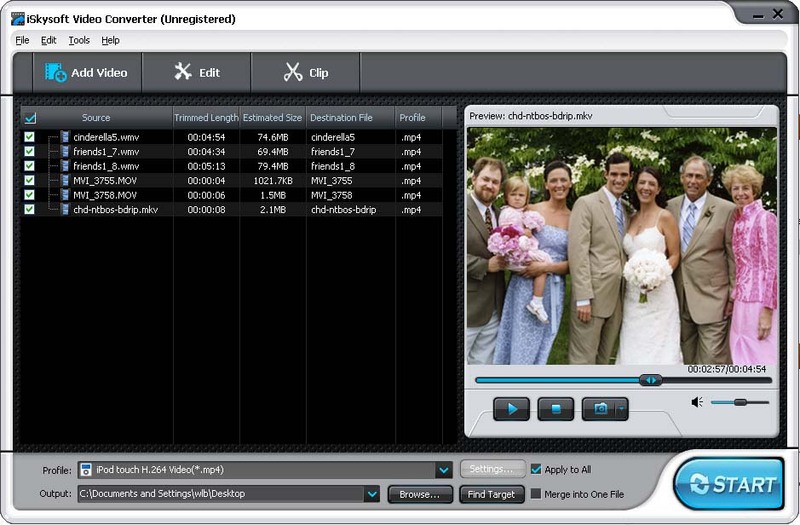 Video Converter Professional is a high quality video file conversion program. Qweas is providing links to iSkysoft Video Converter for Windows 2.0.0.18 as a courtesy, and makes no representations regarding iSkysoft Video Converter for Windows or any other applications or any information related thereto. Any questions, complaints or claims regarding this application iSkysoft Video Converter for Windows 2.0.0.18 must be directed to the appropriate software vendor. You may click the publisher link of iSkysoft Video Converter for Windows on the top of this page to get more details about the vendor.